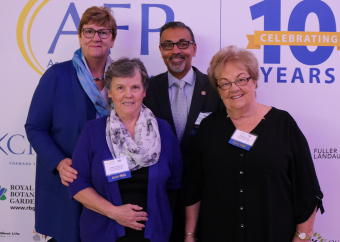 Niagara Health was well represented at the recent Philanthropy Awards hosted by the Association of Fundraising Professionals Golden Horseshoe Chapter. The Hospital Auxiliaries of Niagara Health and Roger Ali, President & CEO of OneFoundation for Niagara Health System, each received awards at the event, which was held on Thursday in Burlington. Niagara Health’s Auxiliaries received the Outstanding Philanthropic Group Award, while Mr. Ali was honoured with the Chapter Achievement Award. Niagara Health President Suzanne Johnston, who attended the event, congratulated the recipients. Also recognized at the event was Niagara company Walker Industries, which received the Outstanding Corporation Award. The Association of Fundraising Professionals Golden Horseshoe Chapter advances philanthropy through ongoing and meaningful educational opportunities. The Philanthropy Awards ceremony is held each year to celebrate National Philanthropy Day, which is Nov. 15.